Is a Collaboration Room Right for Your Business? The key to secure video conferencing is a combination of using the right applications, training team members on video conferencing etiquette, keeping video conference access secure, and ensuring your video conferencing solution is up-to-date. Cisco Webex Board and Webex Meetings are tools that can facilitate secure video conferencing. Secure BYOD environments. Bring your own device (BYOD) is commonplace in many environments. BYOD environments bring a particular set of security concerns. For example, security standards vary from application to application. You need to depend on the device owner to regularly update their device so security patches are in place. For secure video conferencing in a BYOD environment, choose a vendor with a secure, dedicated application. The Cisco Webex Teams app, for example, encrypts data on devices before sending them to the cloud, ensuring end-to-end security. 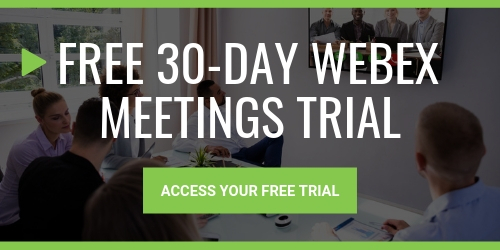 Update your video conferencing solution. Many older video conferencing systems don’t support encryption, which is vital to secure video conferencing. Choose a video conferencing solution that is built for businesses, with robust security protocols for data storage as well as for the video conferences themselves. Secure access to video conferences. When it comes to video conferencing, it’s a balancing act. You want it to be secure, but having multiple logins and passwords makes it difficult to use. Choose a vendor with role-based, single sign-on (SSO) access. With SSO, users have one set of credentials, but those credentials are tied to a profile which determines access. For example, you may conference with external stakeholders. Those stakeholders may have a designated “role” which limits their access to the video conference system. One limitation may be that they can’t record video conferences. Participate in video conferences in a private setting. If you must attend from a public environment such as a café, participate via chat and listen to the meeting through headphones. Request permission from all participants before recording the conference. Only discuss sensitive information in designated video conference meeting rooms. Only connect to teleconferences using secure WiFi. Set clear guidelines for BYOD use, including requiring phone passwords and keeping phones locked when not in use and educating employees about the threats posed by unsafe, third-party applications. Develop a clear video conference policy that makes sense for your municipality and confirm conference participants understand the policy. Take the time to train participants on the video conferencing system so they’re comfortable using the equipment and turning microphones and camera on and off. Cisco security—All Cisco products are required to follow the Cisco Secure Development Lifecycle, which ensures products meet stringent security requirements. Cisco also regularly conducts penetration testing, which is testing that ensures that Cisco’s products and data centers are safe from outside security threats. Data center security—Your video conferences need to be stored somewhere, and that location needs to be secure. Cisco’s data centers offer physical security and network security. Cisco’s network is regularly tested and patched to prevent security breaches. Application security—The Webex application is designed with security in mind. Webex encrypts data, keeping your meetings and any related files or recordings secure. Role-based security—Webex application security is based around roles. Each role has different privileges. For example, a host can schedule and start Webex meetings. A presenter can share information and grant and revoke access to shared applications. These measures ensure that your municipality can conduct efficient meetings about important, sensitive topics without worrying about external security threats. Cisco Webex Board incorporates these security measures while allowing you to wirelessly present to a wide audience. It’s simple to use and touch-based, allowing for collaborative editing and two-way whiteboarding with remote employees. When it comes to implementing video conferencing solutions, many municipalities find it beneficial to work with a trusted partner. IP Consulting understands the unique needs of municipalities, including dealing with funding constraints and policy mandates. IP Consulting has worked with several governmental organizations, helping them implement technology solutions that make their lives easier. IP Consulting will work with your municipality to implement robust video conferencing solutions that meet your needs. Contact us today to get started.